Songs lift our hearts and minds. They powerfully convey truth both poetically and musically. God commands us to love him with our whole being, in the unity of our body and spirit, emotion and intellect. Using biblical songs, this study guide calls God's people to find eternal truth in new and fresh ways, so that our worship to God will be deeper and more joy filled. 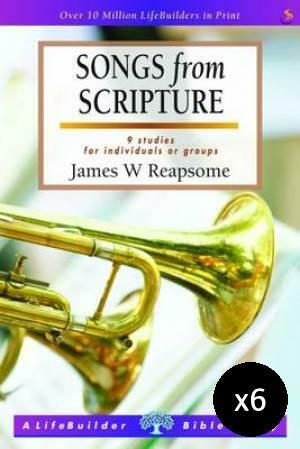 Songs from Scripture - Pack of 6 by James Reapsome was published by Eden bundles in April 2017 and is our 6826th best seller. The ISBN for Songs from Scripture - Pack of 6 is EDENBUNDLE-1932. Be the first to review Songs from Scripture - Pack of 6! Got a question? No problem! Just click here to ask us about Songs from Scripture - Pack of 6. Songs of scripture- would this be suitable to use in a ladies group as a fortnightly study. There is about 8 of us that meet? A:The LifeBuilder studies are designed to have a wide readership and help Christians of all ages find something to relate their lives and faith to. It has 9 studies, and so lasts a short term length. Whilst not tailored to a ladies group, but not excluded from one either. Thank you for using the Q&A Forum.